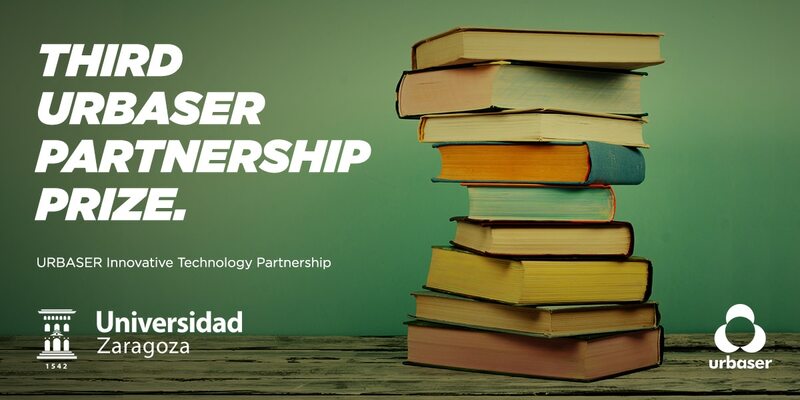 The open call to participate in the 3rd edition of the Universidad de Zaragoza’s URBASER Innovative Technology Partnership will run from 5 to 26 April. Thermochemical processes for recycling and/or recovery applied to urban and industrial waste. Integrated biological, mechanical, or physical-chemical technical processes for the management of urban waste and water integrated into the circular economy. Automation and robotisation of processes applied to waste collection, separation, and treatment. Work on investment return indicators for R&D activities. New systems for industrial process data acquisition and telemetry, and data processing through ‘Big Data’ and artificial intelligence networks. Methods for deodorising waste treatment facilities and urban spaces. Eliminating contaminants from treatment plant sludge. This prize is a clear example of the goals of Cátedra URBASER de Tecnologías Innovadores (the URBASER Innovative Technology Partnership), which seeks to promote the creation of new knowledge, the production of advanced research allowing for academic-corporate evolution and integration, and the development of business sector professor and university student practical training policy in collaboration with the Universidad de Zaragoza. The judges panel will be comprised of Mixed Commission members and the Partnership’s Director, with the prize being awarded before 17 May 2019. The contest’s rules are available for review here.